This week, Vox critic at large Todd VanDerWerff, film critic Alissa Wilkinson, and culture editor Jen Trolio got together to discuss “Chidi Sees the Time-Knife,” the 12th episode of the third season of NBC’s loopy comedy The Good Place. (Because the first two episodes of season three aired as one installment, the episode number is one ahead of the number of weeks the show has aired.) Spoilers follow! Proceed with caution if you haven’t seen the episode! Todd: I do not know that I will ever again see an episode title as beautiful as “Chidi Sees the Time-Knife” in my long, lonely existence. It tells you both everything and nothing about the episode, in that it tells you the episode will be nuttier than usual, while also referring to a one-off event that is mostly a throwaway joke. “Time-Knife” is mostly set-up for The Good Place’s season three finale, which will probably be — though you can never tell with this show — an elaborate sort of re-pilot that will get everybody back into the approximated Good Place, in order to test whether a new group of four humans will help each other become better people. 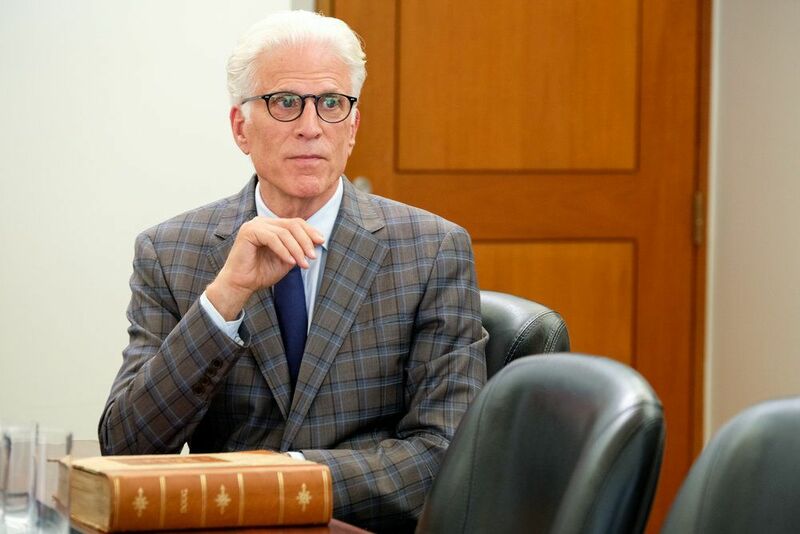 Except this time, the Judge will be watching everything, and Sean and the Bad Place folks will also be involved, both via choosing the four new test subjects and by creating an evil Michael doppelganger, the better to let Ted Danson return to playing the diabolical version of Michael from early season two, something he was so clearly great at. We only see one of the new test subjects — a so-far-nondescript white dude (and “some sort of journalist”) named Jon — and we mostly see him asleep, because the episode’s big cliffhanger (which is a little silly and forced, to my eyes) involves Michael cracking under the pressure of this high-stakes new endeavor, even as Jon is knocking insistently at the door to try to figure out just what’s happening to him. On its way to that point, “Time-Knife” kinda sorta does a good job of tying season three together by re-incorporating the science experiment material from this season’s first few episodes (remember those?) in an afterlife setting where every variable can be controlled as precisely as Michael might want. It’s not a bad set-up for a way to get back to the brass tacks of living in the Good Place, while also allowing for some of the wilder experiments of the second and third seasons. But, of course, this is a show that will likely abandon such premise within a few episodes, because it wants to do a full installment devoted to Doug Forsett’s long walk to Ottawa or something like that. “Time-Knife” has the not-particularly enviable task of feeling bouncy and fun, while also giving away almost nothing about what the season three finale or the ensuing fourth season might look like, which leaves it occasionally spinning its wheels. But, again, it’s an episode called “Chidi Sees the Time-Knife.” I can’t even mildly criticize it! The title is too good! This is not Derek. This is Michael. Alissa: I’ll tell you what I’m most excited about — all of the humans that Janet is making to populate the background of the new fake Good Place. Derek (or, maybe just Jason Mantzoukas) is the most purely funny element of this show to me — I love that his attempt to make classy martinis in this episode translates to just, like, a bunch of olives in a martini glass, or a whole lemon — and I am now excited about a bunch of featured extras playing slightly glitchy human-approximations in future episodes. Anyway, yes — because “Chidi Sees the Time-Knife” is a set-up episode, a lot happens in preparation for whatever’s going to occur in the season finale. (I agree with you, Todd, that Michael’s last-minute breakdown feels a tad contrived.) I am intrigued by the idea that the Judge didn’t really know how complex it was to be a human — not just in our modern era, but generally — which signals a long-running disconnection between the moral order and the people whose fate it decides. That’s a common complaint against philosophy in general and moral philosophy or ethics in particular: It’s all well and good to tell people how to live their lives from inside your ivory tower, but then at some point you have to go home and actually live, and often philosophers’ own lives don’t at all match the ideas they espouse. Martin Heidegger often sounded like an empathetic humanist, but then, also, he joined the Nazi party. All this stuff, all the ways The Good Place drags in hints of real debates in the field of philosophy, is why I love this show. And truthfully I’m still most interested in whether it’s going to get back around to a revamp (or just a total dump) of the point system; I’m starting to wonder if we’ll really have to wait until the show ends (which, I’m guessing, won’t be at the end of season four) to see it happen, but I’m awfully curious about what the conclusion will be about morality at the end of it all. Also, I dig the IHOP, and all the dimensions. And I love how the time-knife turns out to be a throwaway joke, though I also wonder if it’s getting seeded for something in the future? Jen: I have the same question about what the time-knife joke might be seeding for the future. I applaud the throwaway nature of the line, but I feel like it’s gonna turn out to be a Chekov’s Time-Knife, only coming back in the end at best. At the very least, Chidi’s exact description of it — “a trillion different realities folding onto each other like thin sheets of metal forming a single blade” — seems like a Jeremy Bearimy-adjacent safety net that The Good Place’s writers can return to and expand on if they ever find themselves stuck in some inescapable plot corner. But if the show eventually ends without the time-knife ever coming up again, then in hindsight it will just be a hilarious, quirky, very Good Place-y one-off joke. At any rate, I think going forward I’m particularly interested in how The Good Place will continue to shake up a lot of what we’ve come to know about its characters so far. Todd, you make a good point about the latest turn of events giving Ted Danson the chance to return to playing a much more diabolical version of Michael, even as the “real” Michael continues on his path toward good. But in addition to that, we still have Eleanor and Chidi switching roles so that he’s a confident horn-dog and she’s a philosophical nerd, during the scene in Eleanor’s newly recreated clown house; we have Jason making something of an intellectual breakthrough in the moment where he shows real insight as he expresses empathy for Big Noodle’s plight; and, at the very end of the episode, we have Eleanor possibly stepping into a brand new leadership role as Michael falls apart while Jon knocks on the door. Do you think we’re essentially headed for a series of character resets, too, as The Good Place questions whether people can, indeed, change for the better? Todd: Something season three has done really well, I think, is remind us just why Eleanor is the protagonist of this particular story. She might not always be the most interesting character, or the funniest, but she has the most room to grow, and she’s the character who most intuitively understands how to help others. It’s vital to have Eleanor’s journey so central to the show too, because as we see in episodes like this, it would be so easy for everything to collapse into a giant heap of exposition. There are whole scenes of “Chidi Sees the Time-Knife” that are just exposition with jokes. I’m not complaining about this. The concepts are so weird, and the jokes are so funny, that it works. But it would all start to feel a little conceptual without a human core. And for as much as Chidi, Tahani, and Jason give the show elements of that core, it’s Eleanor who is the show’s most approachable character, on most levels. That said: I really thought, when Eleanor and Chidi settled into that clown house and had just a brief look of dread, that they were going to realize they were now essentially pledging themselves to each other for what could turn out to be eternity, and… that didn’t really happen. Instead of dread, they jumped right back into being cute together. And, like, I’m fine with it, but c’mon. It’s eternity. Consider my qualms with the relationship — which I find simultaneously adorable and kind of hard to parse — multiplied and maximized. Anyway, what are you going to do if you get to the afterlife and it turns out to be one of our more consistently disappointing chain restaurants? Or are you both huge fans of IHOP? And is the mention of more dimensions and other weird science stuff making you folks wonder if there’s going to be an overlap between the moral philosophy of the show and theoretical physics? What do we hope The Good Place keeps doing as it reboots itself yet again? This happened last week, but NBC didn’t provide many photos, so you get to look at it now. Alissa: As a New Yorker, I rarely get to go to chain restaurants, and am always completely delighted when I have the chance to go to an IHOP. So I’m totally fine with that as long as I can get pancakes with chocolate chips and whipped cream. But man, theoretical physics! Metaphysics! It’s all coming together. The Good Place’s repeated mention of time being all foldy and bendy in reality this season (the knife, Jeremy Bearimy) and then the idea that it’s harder to be moral “today” than it was in the past has me thinking you’re probably right. And honestly, this show has tackled some pretty complicated concepts already. An episode exploring the interaction between utilitarianism and, say, string theory would be pretty cool. One other thing that came to mind, while watching this episode, was that it fits into the way The Good Place has often felt like it’s also about making … a TV show. They laid out the rules for a “reboot” on the whiteboard, something contrived that has to fit the “story” of the original but which can also have some changes. Did you think about that at all? Jen: Wow, no, I guess it’s already time for a rewatch! Maybe I was too distracted thinking about Tahani’s interdimensional slug-scarf, which I found endlessly disgusting and entertaining. But I see what you’re saying, especially now that the show’s cast will presumably expand to include a mix of new and old characters, with the new ones probably hitting some of the same beats as our central gang. Even though I doubt The Good Place would go so far as to create a “new” version of Eleanor, Chidi, Tahani, and Jason, it is kind of neat to think about the core characters now making cameos in the updated version of the story they “originated.” There’s a lot of potential in that idea, for better or for worse. It actually lends itself to an interesting exercise, in that, if we think ahead to how season four could essentially be a reboot of seasons one through three, what would you want to see The Good Place do differently? What would you want to stay the same? Alissa: I want even more food jokes. Todd: I kind of want to see the show slow down. Season three has consumed so many new premises and story ideas that now that we’re circling back around to, say, Janet and Jason’s relationship, the emotional investment I should be feeling is a little harder to grasp. This is dangerous. So much of what makes The Good Place fun is how it moves like it’s on fire and needs to jump into a nearby lake to quench the flames. But the result is that, a lot of the time, its interpersonal stories are essentially relying on the characters saying how they’re feeling, the actors’ chemistry selling as much, and everybody agreeing that this is what is happening. And I think the show is managing this trick more or less, but it will run out of room eventually. I’d also like The Good Place to figure out a way to indicate just how the things that happen in the afterlife still have a bearing on the morality of our plane of reality. It’s all well and good if humans can become better people in a controlled setting, but, uh, we’re not in a controlled setting. Barring that, I want more characters for D’Arcy Carden to play and/or for Janet to become a god (which she already kind of is). It’s not so much to ask!